How are each of our WCC schools doing? With spring break behind us, our students are now diving into the final months of the 2015-16 school year. Like many of you, we’re eager to support their journey towards the finish line. At this time of year, it’s also important to measure and explore whether our students meet grade-level standards for their learning. Are they on track to be ready for college and career? One of the many meaningful indicators that helps us answer this question — and shape the best path forward — is assessment. Through April and May, our children in Grades 3-8 and 11 at district-run and charter schools take Smarter Balanced assessments, commonly known as SBAC. SBAC assessments are one component of the California Assessment of Student Performance and Progress (CAASPP) System. These computer-based assessments measure grade-level learning in English Language Arts (ELA) and Math, and give us a sense of our students’ progress towards college and career readiness. The SBAC assessments, implemented officially just last year, are considered a more robust and accurate measure of student grade-level learning and achievement than those administered under our state’s previous standardized testing system, in part because SBAC adapts to the skill level of the test-taker. It’s important to stay informed about SBAC to understand how our school community is faring through the transition, how our students are impacted, and how our schools measure up to a new and improved set of academic standards. The information also helps to guide our families’ thinking around where to enroll children for the upcoming school year. Click here to learn more about the standards these tests measure and the format they take on. Click here to search detailed results by school, district, county, or California. 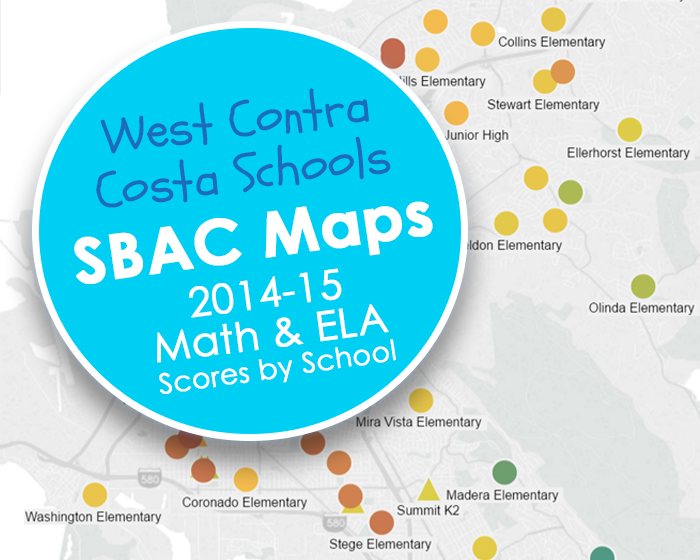 How do I read the SBAC maps? What are some of the trends shown by the maps? TREND 1. The majority of our WCC schools are not meeting — let alone exceeding — standards in Math and English Language Arts. TREND 2. With a few exceptions, our schools generally demonstrated higher rates of proficiency in ELA than in Math. TREND 3. By and large, schools in Richmond are performing more poorly than schools in other regions of West Contra Costa.